In the early 1900s, an archaeologist, William Mills, dug up a treasure-trove of carved stone pipes that had been buried almost 2,000 years earlier. Mills was the first to dig the Native American site, called Tremper Mound, in southern Ohio. And when he inspected the pipes, he made a reasonable – but untested – assumption. The pipes looked as if they had been carved from local stone, and so he said they were. That assumption, first published in 1916, has been repeated in scientific publications to this day. But according to a new analysis, Mills was wrong. 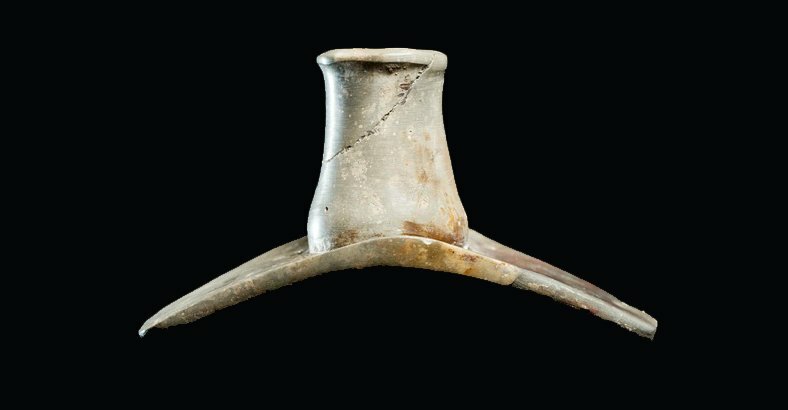 In a new study, the first to actually test the stone pipes and pipestone from quarries across the upper Midwest, researchers conclude that those who buried the pipes in Tremper Mound got most of their pipestone – and perhaps even the finished, carved pipes – from Illinois. The researchers spent nearly a decade on the new research. They first collected the mineralogical signatures of stone found in traditional pipestone quarries in Illinois, Kansas, Michigan, Minnesota, Missouri and Ohio. Then they compared the material found in those quarries to the mineralogical makeup of the artifacts left behind by the people of Tremper Mound. Less than 20 percent of the 111 Tremper Mound pipes they tested were made from local Ohio stone. About 65 percent were carved from flint clay found only in northern Illinois and 18 percent were made of a stone called catlinite – from Minnesota. The researchers describe their findings in a paper in American Antiquity. These results should remind archaeologists that things are not as simple as they sometimes appear, said Thomas Emerson, the principal investigator on the study and the director of the Illinois State Archaeological Survey (ISAS) at the University of Illinois. “This is how mythology becomes encased in science,” he said. The study also confirms that the people who produced these pipestone artifacts, known today as members of the Hopewell tradition, were more diverse and varied in their cultural practices than scientists once appreciated, Emerson said. The Hopewell people, who lived in the region from about 100 B.C. to roughly A.D. 400, have long been the subject of speculation, as the artifacts they left behind and the manner in which these goods were disposed of are not easily understood. Those living in southeastern Ohio, especially, seemed to be “conspicuous consumers and connoisseurs of the exotic,” Emerson said. The Hopewell people from that area collected “massive assemblages of obsidian from Wyoming, mica from the Appalachians, and caches of elaborately carved pipes,” Emerson said. They also collected shells from the Gulf Coast, along with the skulls of exotic animals (an alligator, for instance). “Strange animals, strange minerals, strange things were really a focus,” he said. There is evidence of stone carving at the Illinois sources where the stone was gathered, but none at Tremper Mound, suggesting that the Illinois stone was carved into pipes before it was transported to Ohio. The team used a variety of techniques to analyze the material in the quarries and the artifacts. One method, called X-ray diffraction (XRD), produces a distinct signal that reflects the proportion of minerals in different types of stone. The stone must be pulverized, however, to subject it to XRD. To analyze the intact pipes, the researchers used a non-destructive portable technology, called PIMA, which illuminates a specimen with short-wavelength infrared radiation and records the refracted (unabsorbed) wavelengths, allowing investigators to identify the minerals present. They verified the accuracy of the PIMA by comparing its results to those obtained with XRD on quarry specimens and broken pipes. The new findings should challenge archaeologists to look more carefully at the evidence left behind by the Hopewell people, Emerson said. The research team also included Kenneth Farnsworth, ISAS research associate; Sarah Wisseman, the director of the Program on Ancient Technologies and Archaeological Materials at ISAS; and Randall Hughes, a senior scientist at the Illinois State Geological Survey.